Tinker Toys is a short but fun wall for top ropes or sport leads up clean quartzite faces. The left side of Tinker Toys also provides a nice protectable 5.7 crack. All bolts are well placed and good double chain anchors are located at the top of each route. An 18-inch ledge runs horizontally through the middle of the wall and provides a perfect rest spot. A great wall for playing around and improving your skills. Shade trees at the base provide shade for the belayer, but the wall faces west giving it direct afternoon and evening sunshine. Start from the Rock Canyon parking lot and walk up the canyon for about fifteen minutes. You will pass the first major rock formations, Red Slab and Black Rose, on your right. Don't know why there isn't a route for the face just right of tonca truck, its way fun and you can just use the same top rope chains as you do for T.T. 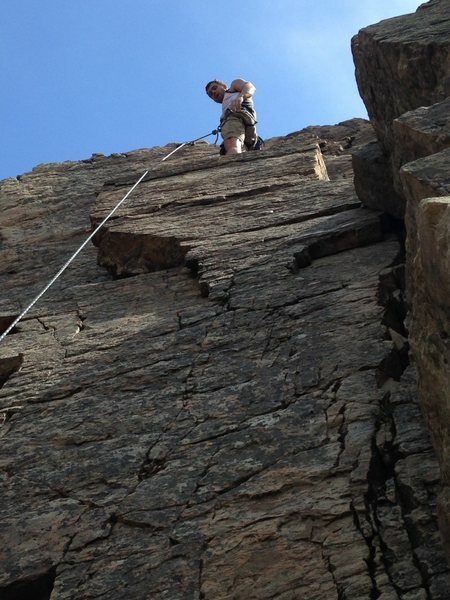 Just have to watch out for rope drag on the top of the outcropping 2/3 of the way up the climb. Pretty easy with the arete to the left and big crack/staircase to the right, harder without. Maybe Im reading the page wrong and there is a name for this climb, my friends and I have been calling it Icky Thump. Brent on the top outcropping of the so called "icky thump"